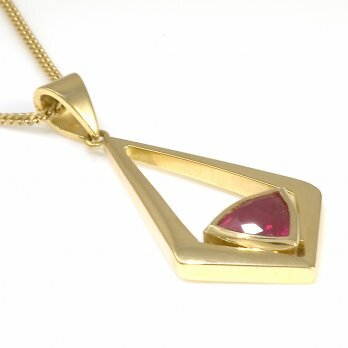 Chain: 18ct Yellow Gold Curb 16"
A gorgeous red ruby is rub-over set into an 18ct yellow gold pendant. The high quality ruby is triangular in shape weighing 1.56ct and cut to a fine standard. The pendant itself is that if an open, elongated diamond. The ruby sits at the bottom of the pendant, a truly elegant piece for any woman. Chain Shown: 18ct Yellow Gold Curb 16"